A mysterious house only shows itself via a small iron door that appears to a special person (or should I say victim) every nine years. Each occasion is a story of its own, but they connect in that mysterious Mitchell way to work against the terrible two behind it all. Would be a great book to read in one sitting on Halloween! Down the road from a working-class British pub, along the brick wall of a narrow alley, if the conditions are exactly right, you’ll find the entrance to Slade House. A stranger will greet you by name and invite you inside. At first, you won’t want to leave. Later, you’ll find that you can’t. Every nine years, the house’s residents—an odd brother and sister—extend a unique invitation to someone who’s different or lonely: a precocious teenager, a recently divorced policeman, a shy college student. But what really goes on inside Slade House? For those who find out, it’s already too late. . . .
Spanning five decades, from the last days of the 1970s to the present, leaping genres, and barreling toward an astonishing conclusion, this intricately woven novel will pull you into a reality-warping new vision of the haunted house story—as only David Mitchell could imagine it. 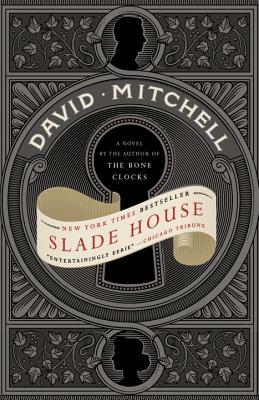 David Mitchell is the award-winning and bestselling author of Slade House, The Bone Clocks, The Thousand Autumns of Jacob de Zoet, Black Swan Green, Cloud Atlas, Number9Dream, and Ghostwritten. Twice shortlisted for the Man Booker Prize, Mitchell was named one of the 100 most influential people in the world by Time in 2007. With KA Yoshida, Mitchell translated from the Japanese the internationally bestselling memoir The Reason I Jump. He lives in Ireland with his wife and two children.